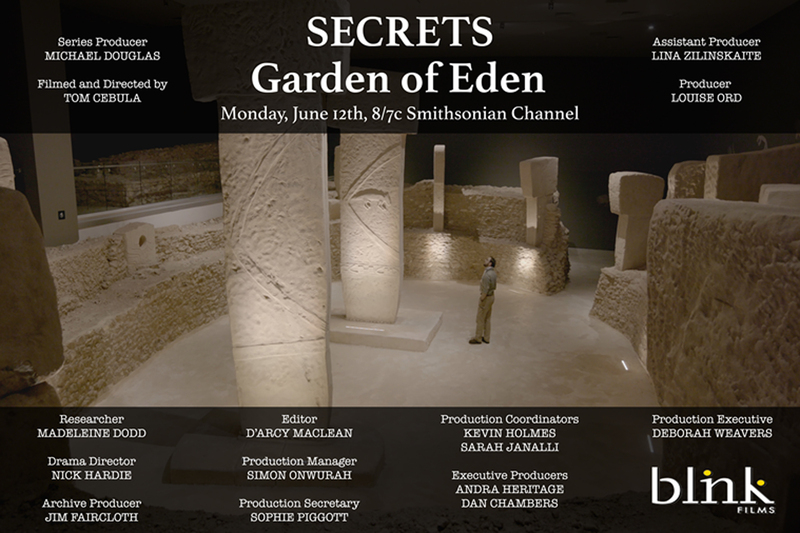 A new National Geographic Channel [external link] documentary movie about current state of research and excavations at Göbekli Tepe, filmed last year and titled “Riddle of the Stone Age Giants” [external link] has premiered February 24th. The show is as an update to an earlier NatGeo documentary (“Cradle of the Gods” [external link] from 2011), but also collects enough new material to become a full feature special and can be viewed online on the channels website here [external link] (for viewers accessing the site from the US). Update: A localized Turkish version of the documentary was just announced [external link] to be aired March 17 via National Geographic Türkiye. A German version is scheduled later this May. “The Story of God” [external link], a documentary series hosted by actor Morgan Freeman and produced by the National Geographic Channel [external link] on the question how religion connects people and where the power of belief actually comes from, is now also aired in German. In Episode 3 “Das Rätsel der Schöpfung” [external link] the roots of ritual and religion are traced back to the Pre-Pottery Neolithic of the Near East – and among the sites discussed and featured, Göbekli Tepe plays a role as well. Broadcast dates and reruns can be found on National Geographic Channel’s German website [external link] regarding the show. We are pleased to announce that next week’s episode of German science magazine “Quarks und Co” [external link] broadcasted by WDR and titled “7 Dinge wie wir wurden, was wir sind” [external link] (7 things how we became what we are) about Neolithic innovations will also feature research of the Göbekli Tepe project. The site and our excavations will be topic of the short film contribution “Der erste Tempel der Menschheit” [external link] (The first temple of humankind) by author Ingo Knopf. The show (in German language) will be aired Tuesday, May 10th 2016 at 21:00 (9:00 pm CEST) on WDR. In a current documentary series produced for and aired at the National Geographic Channel [external link], Hollywood-actor Morgan Freeman embarks on a journey to find out how religion connects people and where the power of belief actually comes from. The show is named “The Story of God” [external link] (and Freeman seems the obvious choice for hosting this, after all he once was God – on the big screen) and explores several chapters of the history of religion, ancient and modern. In the upcoming episode “Creation” [external link], belief and myth are traced back to the Pre-Pottery Neolithic of the Near East. A couple of fascinating archaeological sites and excavations are featured in that episode, among those our’s at Göbekli Tepe as well. The episode will be airing this Sunday, April 24th 2016 at 9:00 pm EST / 8 pm CST on National Geographic Channel in the US, and later this week in 170 countries globally.